Bah Humbug! 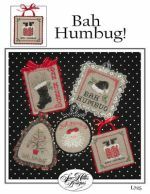 from Sue Hillis Designs contains 5 Christmas ornaments ranging in size from 37w x 51h to 47w x 47h stitched on 16/32ct Natural using DMC/Sullivan floss. 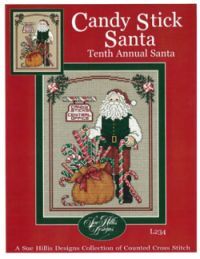 Candy Stick Santa the 10th annual Santa from Sue Hillis is stitched on 14/28 count Summer Khaki with a stitch count of 96w x 122h using Sullivan threads with DMC conversion available. 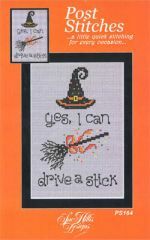 Yes, I Can Drive a Stick from Sue Hillis Designs is stitched on 30ct Weeks Dye Works Lilac or fabric of your choice using Sullivans Floss with DMC conversion. 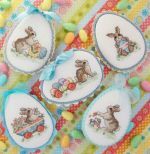 Easter Parade by Sue Hillis Designs are stitched on 14/28count Fabric Flair Antique White, each ornament is different size but 49w x 33h is the largest vertical and horizontal stitch count. DMC or Sullivan's floss. 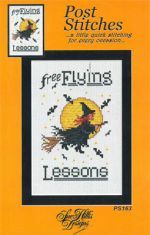 Free Flying Lessons, a new Post Stitch from Sue Hillis Designs is stitched on 14/28ct Antique White fabric from Fabric Flair using Sullivan floss with a DMC conversion available. 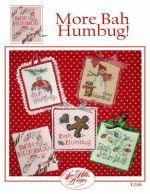 Gingerbread Santa from Sue Hillis Designs is stitched on 14 count or 28 count Summer Khaki with a stitch count of 96w x 122h using DMC or Anchor floss. Charm is included. 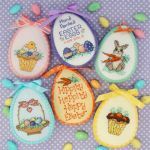 Hippity Hop from Sue Hilllis Designs is another Easter ornament pattern offered this year stitched on Fabric Flair's 14/28 count Antique White. Ornaments are of different sizes but 36w x 49h is the largest vertical and horizontal counts. DMC or Sullivans floss is used. More Bah Humbug! 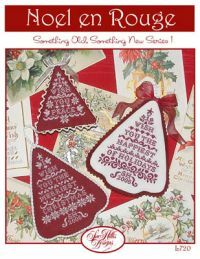 from Sue Hillis Designs contains 5 Christmas ornaments stitched on 14/28 fabric from Fabric Flair, 30ct Weeks Dye Works Parchment or fabric of your choice. The stitch counts range from 33w x 48h to 45w x 53h using DMC/Sullivan floss. Needlework Trees, Series 2 from Sue Hillis Designs are 3 ornaments stitched on 14/28ct Antique White, with the Peace Tree ornament being stitched on 32ct fabric with stitch counts ranging from 27w x 51h to 51w x 67h using Sullivan threads with DMC Conversion provided. Peace Tree utilizes Dinky Dyes Silk Fiber but you can use a hand-dyed fiber of your choice. Finishing instructions included. 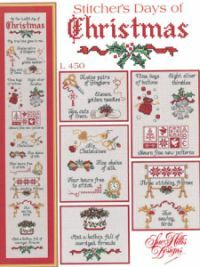 Noel en Rouge from Sue Hillis Designs are shown stitched on 14/28count Antique White or 14/28count Victoria Red with stitch counts for the 2 patterns being 85w x 111h for Merriest or Happiest Christmas and 59w x 73h for Peace Tree. Sullivans floss was used, you may use a fiber of your choice and color. Ooh, too tight? from Sue Hillis Designs is stitched on 14/28count Waterfall Blue from Fabric Flair with a stitch count of 60w x83h using Sullivan or DMC floss. Pajama Santa the Ninth Annual Santa from Sue Hillis Designs is stitched on 14/28 count Summer Khaki fabric with a stitch count of 96w x 122h using Sullivan floss with DMC alternative. 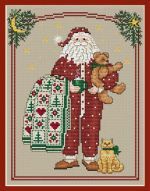 Poinsettia Santa from Sue Hillis Designs is stitched on 14 count or 28 count Summer Khaki with a stitch count of 96w x 122h using DMC or Anchor floss. 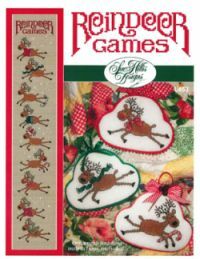 Reindeer Games from Sue Hillis Designs is stitched on 14/28count Summer Khanki. The stitch count for the banner is 83w x 487h, the ornaments are stitched on Weeks Dye Works color Linen or fabric of your choice with a stitch count of 71w x 54h using Sullivan threads with DMC conversion. Ornament finishing instructions are included. 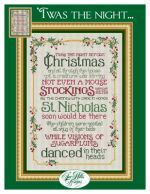 Santa's Ark from Sue Hillis Designs is stitched on 14 count or 28 count Summer Khaki with a stitch count of 96w x 122h using DMC or Anchor floss. This is the 3rd In Sue's Annual Santa series. An Ark charm is included. 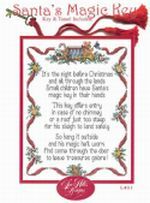 Santa's Magic Key from Sue Hillis Designs is stitched on 14 count or 28 count Antique White with a stitch count of 108w x 160h using DMC or Anchor floss. The Magic Key and Tassel are included. 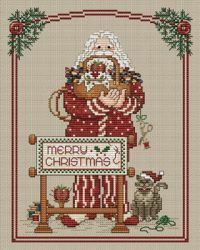 Snowflake Santa, the 7th annual Santa from Sue Hillis Designs is stitched on 14 count or 28 count Summer Khaki with a stitch count of 96w x 122h using DMC or Anchor floss. 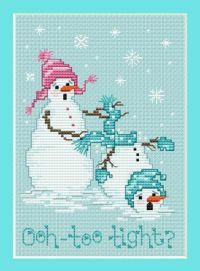 Snowman Wisdom from Sue Hillis Designs is stitched on 14/28count Waterfall Blue from Fabric Flair with a stitch count of 118w x 323h using Sullivans or DMC floss. 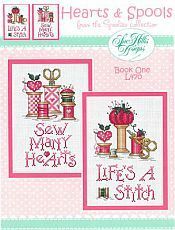 Stitcher's Days of Christmas from Sue Hill Designs is stitched on 14 count or 28 count Antique White with a stitch count of 79w x 490h using DMC or Anchor floss. 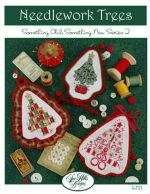 Stitching Santa from Sue Hillis Designs is stitched on 14 count or 28 count Summer Khaki with a stitch count of 96w x 122h using DMC or Anchor floss. 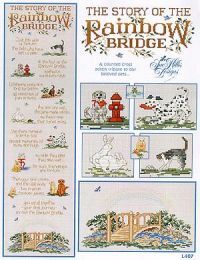 The Story of the Rainbow Bridge from Sue Hill Designs is stitched on 14 count or 28 count Antique White or use a hand-dyed Sky Blue fabric with a stitch count of 127w x 497h using DMC or Anchor floss. 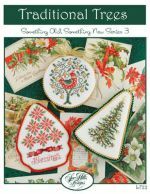 Traditional Trees, Series 3 from Sue Hillis Designs are 3 ornaments stitched on 14/28ct Antique White with stitch counts ranging from 35w x 56h to 47w x 64h using Sullivan threads with DMC Conversion provided, 2 Mill Hill Beads and finishing instructions included. 'Twas the Night from Sue Hillis Designs is stitched on 15/30 count Weeks Dye Works Light Khaki or fabric of your choice with a stitch count of 153w x 223h using Sullivan or DMC floss.